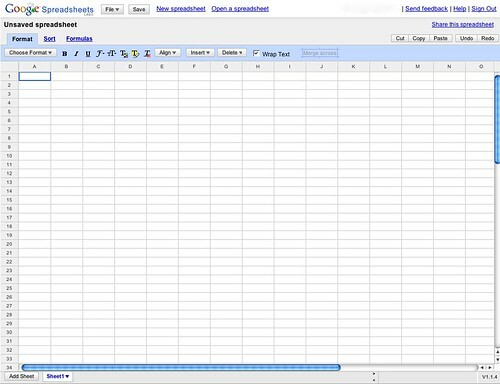 Google launched an online spreadsheet application earlier today. To overcome the problems experienced with previous launches, they are limiting the numbers of people who can access it by asking people to go through a signup process. I signed up for a Google Spreadsheet account this afternoon and I received one already. You guessed it, I received my logon for my Gmail account a few minutes ago and no sign of the sign up for the tomrafteryit.net account! So from my completely unscientific experiment, it seems that Google gives preference to Gmail account holders when signing up for Google Spreadsheet. Welcome to the blogosphere Adam! They also give jobs on that basis too. Or so the Googler University Recruiter implied. “I prefer people who send in CV’s from a gmail account, it shows me you understand and use our products.” or something to that effect anyway. It was very interesting, when she was asked by a student “You have allot of personal information available to you from our recorded search history & trends, do you use this to check someone out when they apply”….yet she managed to turn it into…. “Of course we use our own product and google you when you send in a CV”…. Student repeats question… she pretends he’s hard of hearing and answers louder. hmmmmm.